Beautiful .925 silver bracelet with a symbol of Infinity: the symbol of infinite love and infinite friendship. For now and forever! Luxuriously finished with 13 glittering zirconia stones. Luxurious wrapped, ready to give gift. ♥ Door-and-door made of genuine .925 silver. ♥ Handmade in Italy, luxury quality. ♥ Available in two children's sizes and in ladies' fashion. ♥ Each bracelet has a 3 cm extension chain for a perfect fit. ♥ The beautiful zirconia stones are firmly placed in the silver, so not stuck. ♥ The bracelet is made of strong 2 mm anchor switches. ♥ The infinity symbol is approximately 2.5 cm wide: graceful, delicate, and yet not too mini. 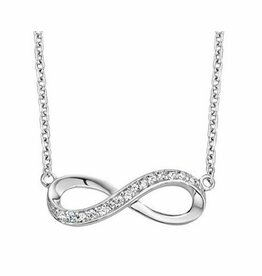 Gorgeous .925 silver necklace with a symbol of Ininity: the symbol of infinite love and infinite friendship. For now and forever! Luxury finished with 13 sparkling CZ stones. Luxury wrapped, as ready for gift giving.